Main Finding – Ad blocking continues to be stable in Canada! IAB Canada released its second annual, comprehensive study of ad blocking powered by comScore data, that explores the Canadian consumer incidence of ad blocking usage, as well as consumer attitudes towards ads and why they use technology that allows them to skip ads. 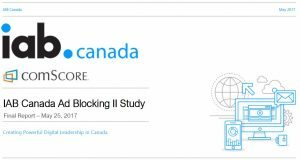 **IAB Canada Members can download the FULL 2017 Ad Blocking Report by clicking here and logging in to the Member Portal with your IAB Canada username and password. If you do not have an IAB Canada user name and password for the Member Portal, please email mpavao@iabcanada.com to request one. The study showed that despite high awareness, only one-in-six (18%) of online Canadians have ad blocking software/apps installed on their desktop device(s). The trend is stable compared to 17% in the previous survey, based on 8 months of passive measurement data in each study. Main reasons cited for ad blocking include advertising clutter, device performance and privacy. French Canadians surveyed have slightly higher usage rates than Total Canada (20% vs 18%). Regionally users of ad blockers range from 13% in Atlantic Canada up to 20% in Quebec. Not surprisingly, the highest ad blocking incidence is among millennials (26%), peaking at 33% of males 18-24 and 44% of French Canada males 18-24. Same as the previous study, few Canadians (5%) have installed ad blocking software/apps on their cell phones, 7% on tablets. Interestingly, while awareness of ad blocking apps is somewhat higher in the new study (85%), considerably fewer Canadians actually use ad blockers than think they do… and three quarters have still never used one. Confirmed users correctly identified ad blockers by brand as the apps they use, rather than anti-virus software or pop-up blockers. One in three non-users are at risk representing 29% of Canadians, who indicate they are likely to use an ad blocker in the near future. While Potential Blockers have a better attitude towards advertising than current ad blocker users, they are more likely to blame ads for slow loading than other non-blockers. However, users are more annoyed than Potential Blockers by ads that play video or audio automatically, long video ads before a short video and ads that make page content move. Importantly, over three quarters of Canadians still prefer ad supported free content on the Internet, similar to the previous survey – these are the ‘Ad Receptives’. The biggest motivators cited for uninstalling/no longer using ad blockers included site requests to turn off their ad blocker and blocked site content. This underscores the appropriateness of the publisher community’s efforts to detect ad blocking software and suspend content delivery until the publisher site is either whitelisted or the ad blocker is removed. Based on concept testing, the study clearly indicates that publishers have some leverage over protecting their revenue streams from ad blocking and may be able to reclaim current users of these apps. Continued industry-wide impetus towards implementing the IAB principles of LEAN ads to respect the consumer online experience and the DEAL approach to creating an honest, ethical and fair conversation with consumers about ad blocking, will make a meaningful long term impact. Click here to download the previous IAB Canada Ad Blocking Report from 2016. The Interactive Advertising Bureau of Canada (IAB Canada) is the national voice and thought leader of the Canadian interactive marketing and advertising industry. We are the only trade association exclusively dedicated to the development and promotion of the digital marketing and advertising sector in Canada. As a not-for-profit association, IAB Canada represents over 250 of Canada’s most well-known and respected advertisers, ad agencies, media companies, service providers, educational institutions and government associations. Our members represent a diverse range of stakeholders in the rapidly growing Canadian digital marketing and advertising sector, and include numerous small and medium sized enterprises.